This dusky flathead can be easily distinguished by the markings in its tail. 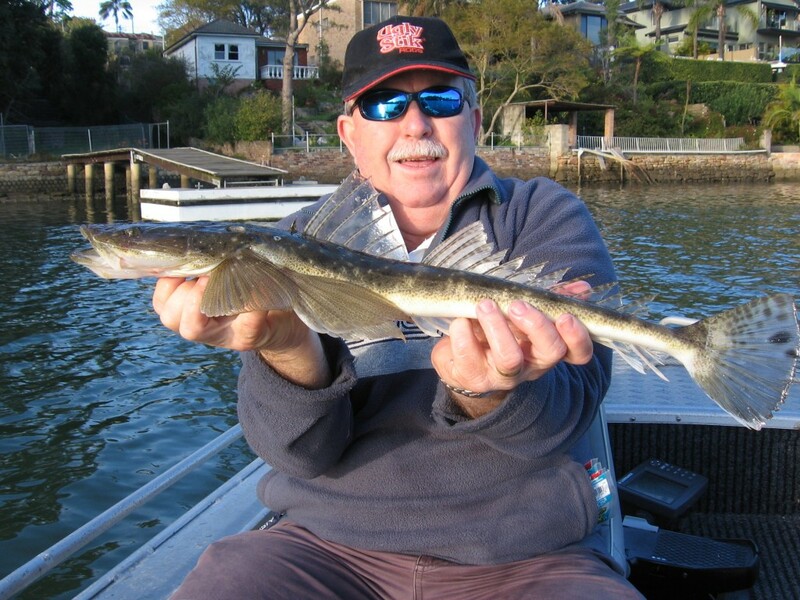 Whether you are fishing off the shore or out of a boat for flathead, bait fishing for them is a lot of fun and they can be caught right around Australia. Do you know how many different types of flathead there are around Australia? I don’t, but I do know of about 8 that I have caught over the years. They are the dusky, rock, tiger, southern sand, southern blue-spotted, northern sand, marbled, mud and the bar-tailed flathead. All of which have been caught while using a variety of baits. 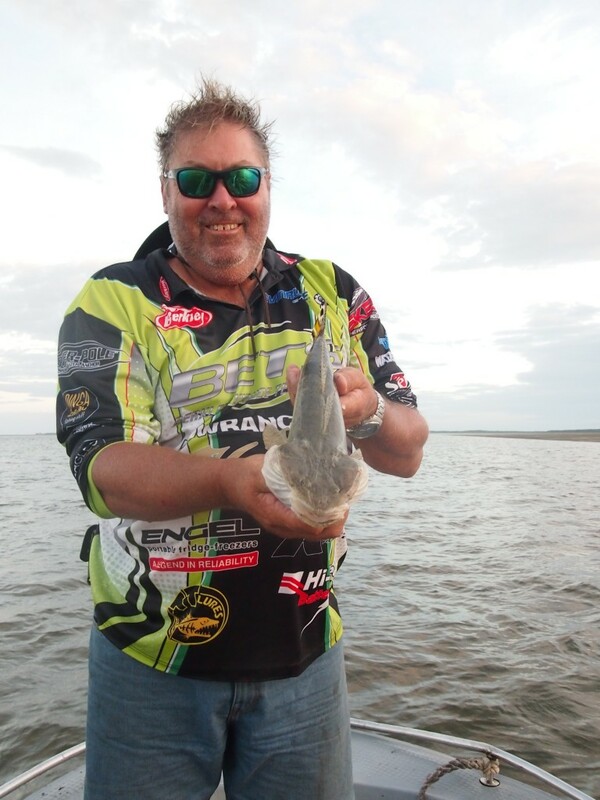 Dave caught this bar-tailed flathead while using live mullet in the Nomenade Creek, just north of Weipa. Even though flathead will eat just about everything that is put in front of them, some baits will stand out more than others. At the top of my list of baits would be live ones. Poddy mullet, yellowtail, slimy mackerel, pilchards, whitebait, blood, tube and beach worms, plus the pink nipper and spider crabs. Next on the list for me would be strips of mullet, slimy mackerel, yellowtail, pilchards, flathead, skirt steak and chicken breast. Flathead live and feed on the bottom of creeks, rivers, bays and offshore. They will patiently lay just under the sand and mud waiting for any unsuspecting prey to come close by. Even though you may not think that flathead don’t have much speed. They are extremely quick off the mark and with their rather large mouth they can swallow just about any of their prey whole. Even smaller size flathead. Places that you could try and catch a few flathead would be at the edges of mangroves, sand or mud bars, off the beach in gutters, in and around oysters leases, at the edges of drop-offs and rock bars, along the edge of breakwalls and areas offshore where the sand meets reefs or broken shell or grit. What I have found over the years is that flathead will lay facing the direction of where the current is coming from. 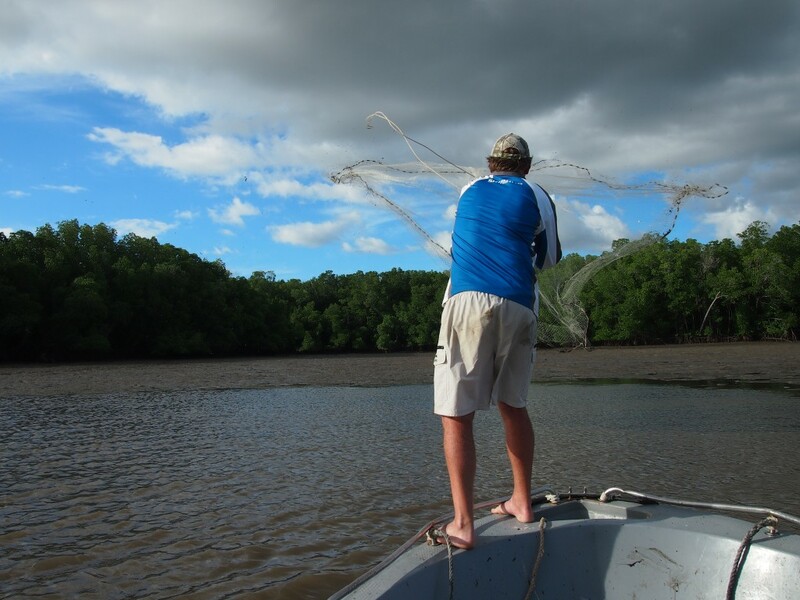 Cast nets are a great way to catch your live bait, but you will need to check your states Fisheries Requirements, as they can’t be used in NSW. Ball sinker down onto the bait. 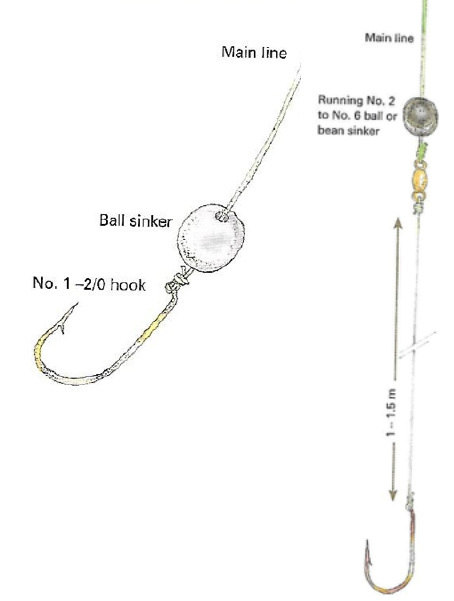 Sinker down onto a set of ganged hooks. If fishing from the shore or boat where you don’t have to get a lot of distance you could get away with a 1.8 to 2.1 metre rod and a 30 to 40 sized reel. Currently I am using a 2.1 metre Shakespeare Ugly Stik Platinum rod with a Pflueger Trion size 40 threadline, spooled with 3 kilo Berkley Trilene. 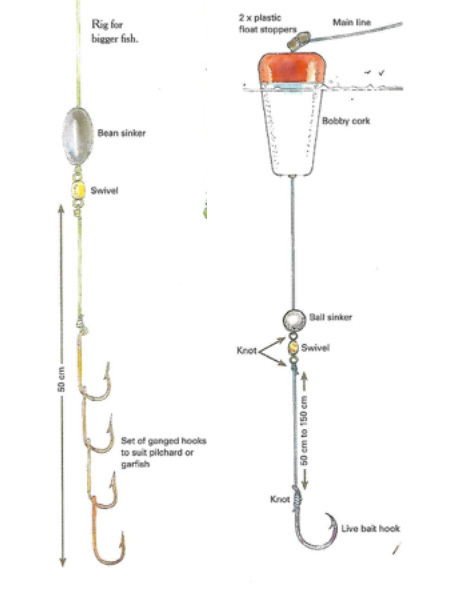 Now if you were fishing from the beach where you will need that extra casting distance or off a breakwall where you not only need extra casting distance, but the power to lift the flathead out of the water you will need to have a couple of rods. One for the beach and one for the breakwall. They would range from 3 to 3.6 metre rod and a 40 to 60 size reel. Currently I am using the 3.6 metre Shakespeare Ugly Stik Gold 3 to 7 kilo rod with the size 60 Pflueger Salt threadline spooled with 8 kilo Trilene for off the breakwalls and for off the beach or in the estuary I am using the 3.2 metre Penn Prevail rod matched with a 40 Pflueger Salt threadline spooled with 6 kilo Trilene. On the other hand, if you prefer to drift offshore for sand, blue-spot and tiger flathead you should think about getting hold of the following outfit. A Shakespeare Ugly Stik Gold 1.65 overhead rod matched with a Penn 40LD Squall O/H reel, spooled with 15 kilo Berkley Fireline. This outfit would be ideal to use with the paternoster rig.